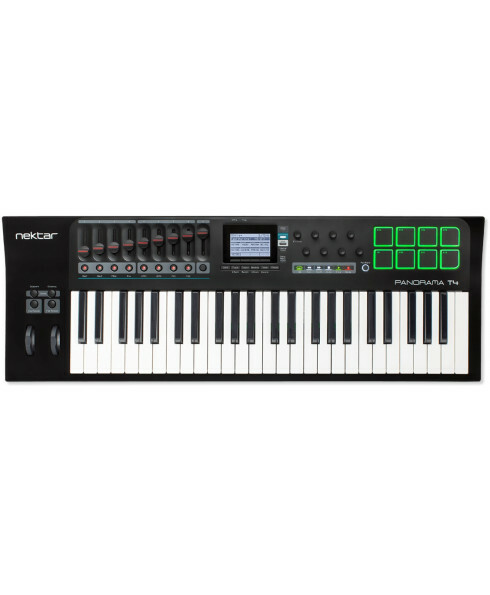 Controlador Midi Nektar Panorama T4. Panorama T4 & T6 are the first controllers to deliver Nektar-level instrument plugin control in any VST/AU compatible DAW. Grab/learn parameters - take control of any parameter on the active instrument immediately. Hold: Holds played notes until deactivated - great with legato. Layer up to 8 VST/VST3/AU plugins with Panorama mix control of volume, pan, mute, solo and select. As a low powered USB device, Panorama T4 and T6 work with all USB devices that feature a Class compliant MIDI driver. This includes all version of Windows from XP and higher, Apple OS X 10.5 and higher plus Linux (as long as a USB MIDI driver package is installed). Apple iOS is supported using Apple's powered USB camera connection kit.